Uveal melanoma is a cancer of the eye, and is the most common eye cancer diagnosed in adults. 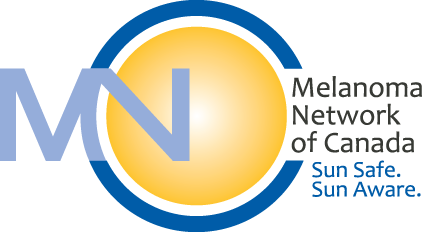 There has been extensive research to help improve the management strategies and therapies used in the future among this rare form of melanoma. 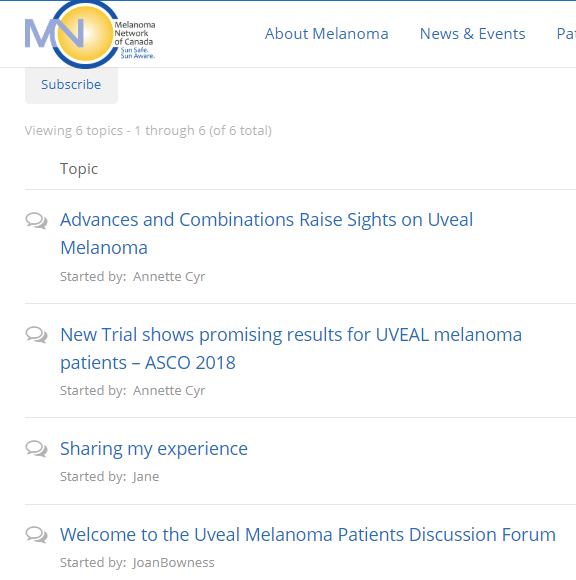 We are pleased to offer this informative webinar of the latest information on advances and treatments for uveal melanoma patients. Presented by leading medical experts. Presentation Topic: An update on diagnosis and treatment of melanoma and the value of genetic testing. Marcus Butler is a physician investigator with an interest in the translational development of immune-based therapies for cancer patients. He joined the Department of Medical Oncology and Hematology at Princess Margaret Cancer Centre in 2012 and is an Assistant Professor at the University of Toronto. He cares for patients with melanoma and gynecologic malignancies and is the director of the Princess Margaret Immune Monitoring Laboratory. His work focuses on the development of immunotherapy trials, which include studies, alone and in combination, of immune checkpoint blocking antibodies, immunomodulators, and adoptive cell transfer. Hatem Krema, MD is the Director of the Ocular Oncology services of Princess Margaret Cancer Centre/ University Health Network, University of Toronto, Ontario, Canada. He is an Associate Professor in the Department of Ophthalmology and Vision Science of University of Toronto. He graduated from Cairo University in 1990 and obtained his Master’s degree in Ophthalmology from the same University. He was elected a fellow of the Royal College of Surgeon of Edinburgh, United Kingdom in 1997. He started his training in Ocular Oncology at the Royal Liverpool University Hospital, England, United Kingdom; and at Bascom Palmer Eye Institute in the University of Miami, Florida, USA. He completed his fellowship training in ocular oncology at Wills Eye Institute, Thomas Jefferson University, Philadelphia, Pennsylvania, USA, and was also trained as a clinical fellow in Ocular Oncology at University of Toronto. Dr. Krema is interested in translational clinical research in the field of ophthalmic oncology. His focus is on defining better algorithms for radiotherapy in ocular and adnexal cancers, management of treatment complications, introduction of innovative surgical techniques, interpretation of modern ancillary diagnostic imaging, and the role of molecular genomics in identifying patients at risk of metastatic disease. With his clinical and surgical duties, Dr. Krema has a full schedule of teaching and academic activities. He has been invited to provide courses and teaching sessions in ocular oncology to residents and fellows in several countries, and he was granted The Residents’ Award for the best Teacher in the Department of Ophthalmology of University of Toronto in 2013. He has been titled an Honorary Fellow of the International Council of Ophthalmology in 2017. He has been also invited as a guest speaker in several national and international conferences, and he is a frequent presenter and moderator in international ophthalmology meetings, with over 150 paper presentations. Jaime Jessen, BSC, MSc, CGC, CCGC has obtained BSc in Biology from York University, and MSc in genetic counselling from Newcastle University, Australia. Jaime has earned certification from both the Canadian Association of Genetic Counsellors (CAGC) and The American Board of Genetic Counseling (CGC). Jaime has 13 years experience as a clinical genetic counsellor providing patients and families with the information, they require to make informed decisions. Jaime is a resource to both healthcare providers and patients as her role as Medical Science Liaison at Impact Genetics. Jaime’s passion for the provision of support and specialized medical knowledge compliments the high quality genetic testing services offered by Impact Genetics. 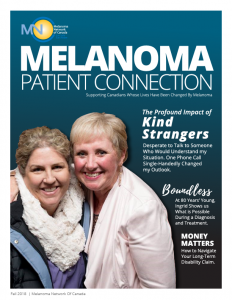 Melanoma patient stories, treatment and drug information, and MNC events straight to your inbox. 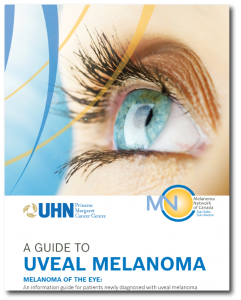 This guide provides information for newly diagnosed patients with uveal melanoma. The guide provides a good overview of this rare and often challenging disease.